Marney-Rose Edge's watercolour florals capture the delicacy of the blooms and juxtapose them with dramatic backgrounds. The results are stunning works filled with light, colour, and the beauty of nature. 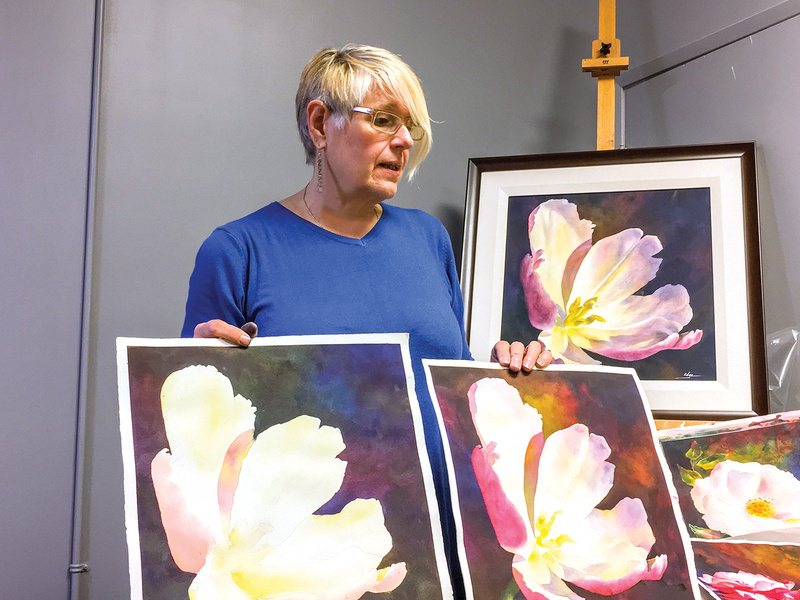 For the watermedia piece, The Embrace, Marney-Rose selected a tulip that had been soaking up the sun in her living room and gave it a continued life on paper with its petals reaching out from a deeply coloured background. "Contrast creates drama," she reveals. "I create rich, dark backgrounds for the flowers, giving a dramatic feel in a realistic style." Both photography and drawing are part of her process. Her own photos offer a reference. "When printed on paper, photos have a compressed range that make it more challenging to see details in the light and dark areas. I have enlisted the aid of my tablet to see into the shadow areas to make sure I have the correct shapes," she notes. "I practice drawing from life as much as possible to train my eye in proportion and perspective. Drawing changes how we 'see' subjects. We will notice subtleties in value changes and nuances of color shifts that aren’t apparent before we learn to draw." She draws on tracing paper first, to avoid damage to the watercolour paper from multiple erasures. 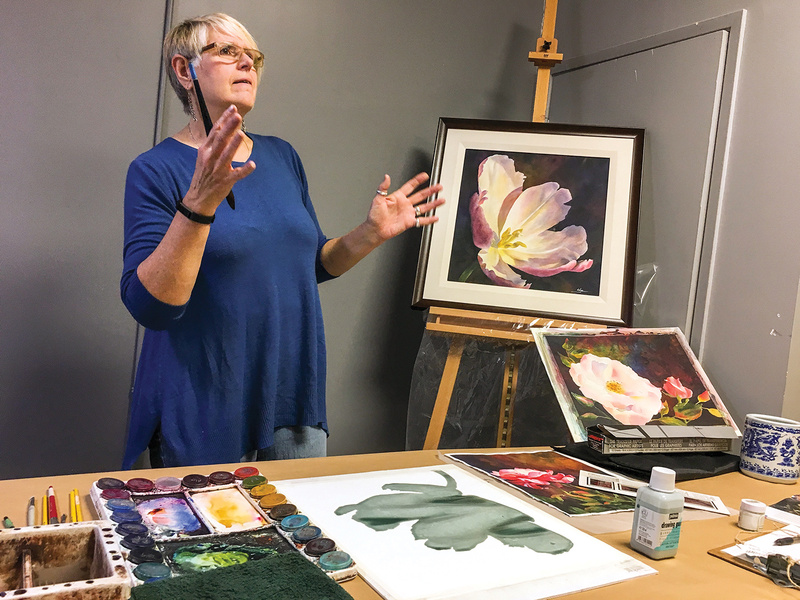 Once a study for a composition is complete, the outside outline of the flower is transferred to watercolour paper using wax free graphite paper. This is then masked with Pebeo Drawing Gum to retain the white of the paper during the painting of the background. Further details will be added once the mask has been removed. "The one thing that impacts the final result more than anything is what I paint on." 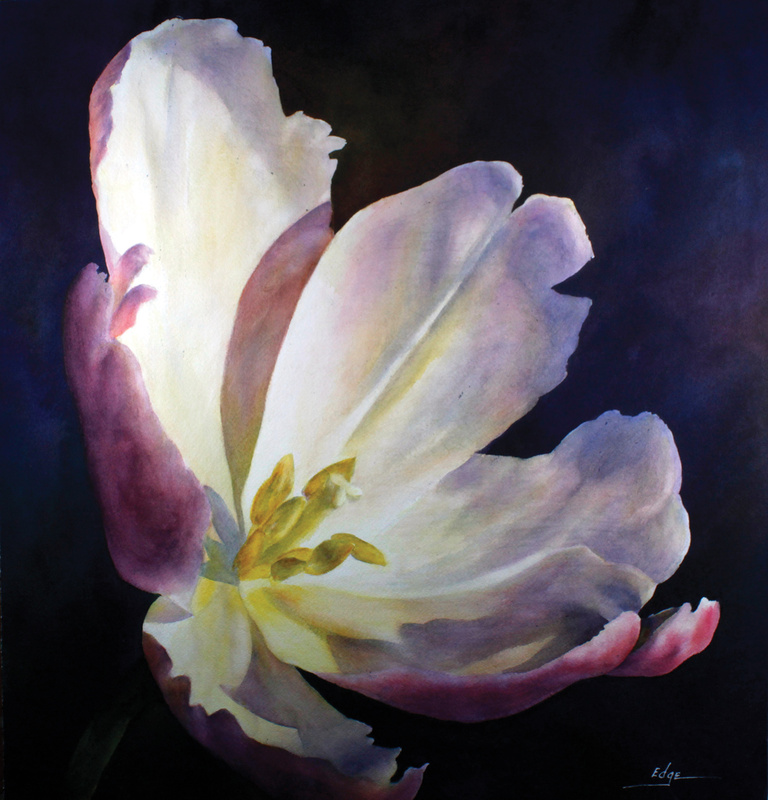 One of Marney-Rose's favourites is Arches 140lb Cold Press Watercolour paper. "The dark background gives the full range of values as this is the darkest and the white of the paper [preserved by the mask] is the lightest," she says. "The background is painted first as I have the least investment regarding time in case it does not work. When it does not work, I can wash it off and start over, having an underpainting left behind by the staining paints I have used." "The masking of the flower enables me to paint the background intuitively, moving from one color to the next creating variety. I primarily work with transparent paints which are staining and the colors build much quicker as I work on dry paper. 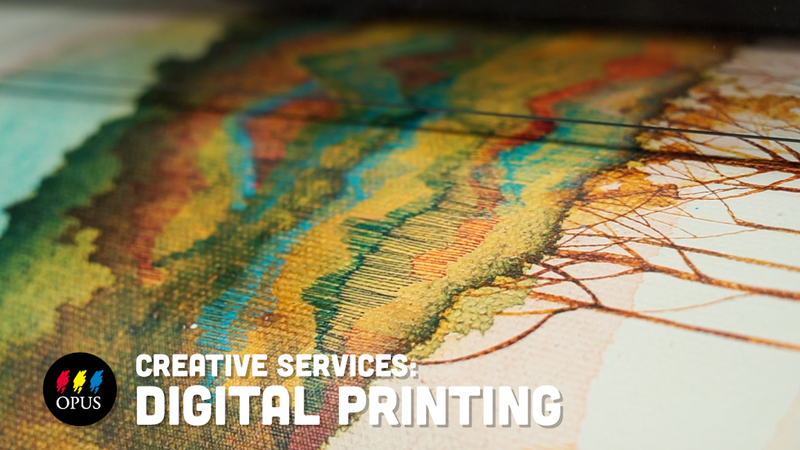 I may include colors that granulate to add texture organically." The background is usually complete in three layers. Once dry, the masking is removed, details are traced in its place, and the flower form begins to take shape. "When the masking is removed, I don’t use it again. 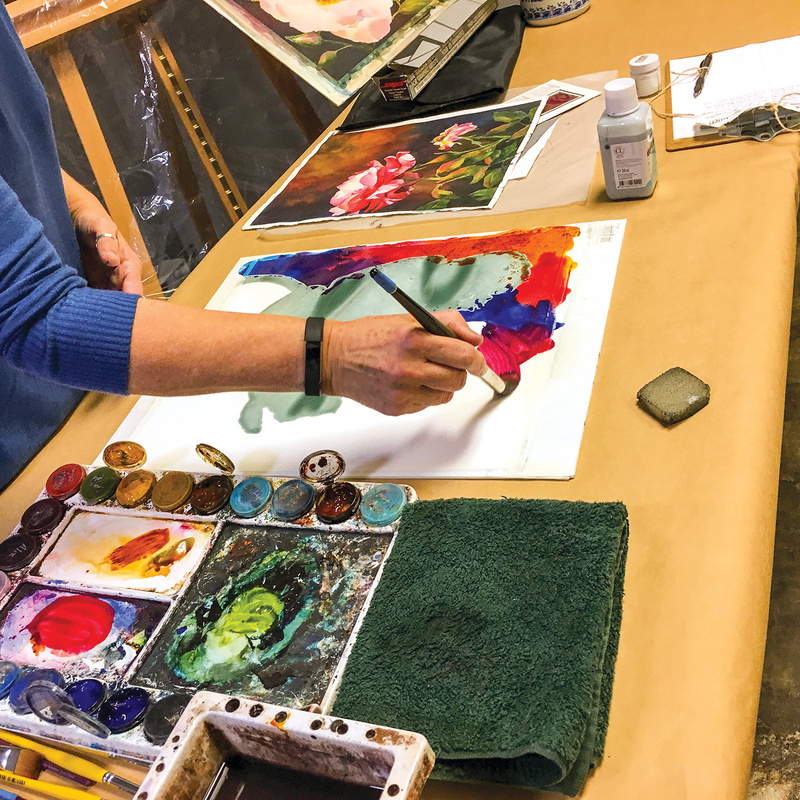 The use of masking fluid means there are no soft edges between the flower and the background so I create lost edges for the flowers so they do not look stuck on. Petals recede where they need to and come forward with the hard edges." A combination of techniques - wet in wet, wet on dry and glazing alternating between warm and cool layers - are used to complete the work.